Here’s Day 3 of the St. Monica Novena! St Monica please pray for my God daughter who is causing a lot of trouble in her home to her parents and sisters. I would also like prayers for my son, his wife and 2 beautiful grand children that the faith will be passed down to them. Also pray for my daughter that she will be blessed with a God loving husband and they will blessed with a happy home. ST MONICA PRAY FOR ALL. Please pray for my siblings, who are all cradle Catholics, most are divorced and/or remarried. They have not practiced their faith and have swept God under the rug. Only a miracle through your intercession, dear St. Monica, can wake them up and save them. They all have children and even grandchildren, who sadly have not been passed the faith. Please intercede, St. Monica, thank you. St. Monica, please pray for my family that those that don’t believe or know God, that they be touched by the grace of God, and come to Him. I pray for my husband now, and for our marriage. That we develop a deep love for each other, and help each other reach our final goal….to be in heaven with God and all those loved ones that have gone before us. Amen. JESUS AND MARY I LOVE YOU, PLEASE SAVE SOULS…..
Dear Jesus, I am having to fight for custody of my children. My Autistic daughther’s health is suffering do to lack of better diet and help. My children miss me, specially the younger ones. My son Jose is suffering from depression and anxiety and an eating disorder. My older children have left the church. St. Monica pray for us. St. Monica, please pray for my husband and for his job. I have prayed this same prayer for many years now and while he has always had a good job, he’s always been so unhappy and very stressed about this area of his life. Please pray that God will heal his current job so it can be a source of happiness and content for him. If this is not to be, please pray that God will send him employment that will fulfill him in all the ways he needs to be fulfilled. For many years I’ve had a list of loved ones and friends that I pray for their conversion/reversion to the faith. Today I received a text from one of those people asking for wisdom because he felt he was being called back God’s Holy Catholic Church! 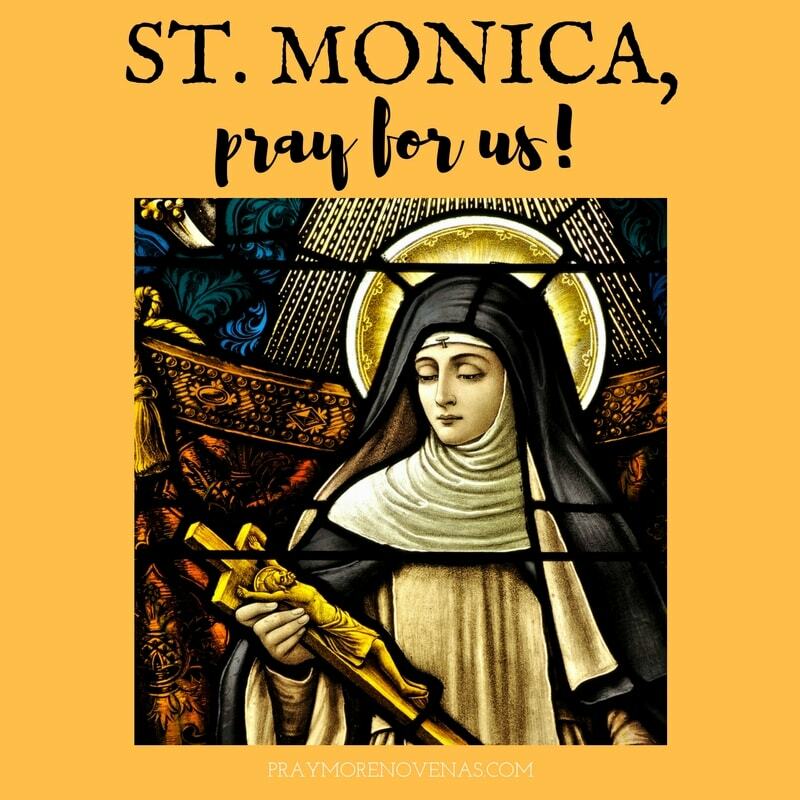 Thank you St. Monica for your intercession… PRAISE GOD!!! Praying for all to know the Blessed Mother and take your prayers to her. She does love you . St. Monica, we ask your intercession as we discern and plan for the growth of our family. That our prayer and discernment may lead us and our family into alignment with God’s will. Pray that we might be more faithful in practicing our faith so we may love and serve each other and those we encounter with greater charity and compassion and that our lives may be one of witness of the love God has for us. Finally, we ask for your intercession for our health, safety, and protection from harm and evil. Pray for my family members who are weak in the faith and all those who have abandoned the Catholic Christian teachings. I also pray for Vivian who has turned her back on God for a long time and blames God for everything! I pray that she will forgive herself, her boys for what has transpired in her life. ???? In Jesus Holy name.???? Praying for my God-daughter Tiffany for positive choices in her self care after her Surgery for a total healing of the tumor removed on her breast. May her examination by her heart specialist results be excellent and Tiffany become stronger and prayerful as she deals with this ordeal in Jesus Holy name.??? ?Praying for her family while they’re waiting for the results. St.Monica , I entrust our marriage to you. Help bring us closer together like we were 27 years ago. He is a Godly man , etc. But “life ” has taken over. Especially financial difficulties due to recession, past disease, and wanting to keep our children in Catholic schools. Increase his faith / trust in you. May our marriage be more like Mary and Joseph’s ‘. AMEN !! I pray that you may strengthen my marriage in this long distance relationship .Its really difficult living like this, but with your mercy, please give me the strength, the power to continue supporting my husbands decision. His going to be deploid for 1 year, and I pray to see him first before he goes for his tour of duty. In Jesus name I pray. Amen. For my two sons who are in recovery from their father’s abuse, for their continued conversion in Christ, and for my youngest son who has turned from the Church, rejecting the faith as he was taught it by his father. For my continued conversion and recovery, and perseverance in doing what is needed, with faith in God’s providential care. For my ex husband who suffers from a personality disorder and seems incapable of questioning any of his actions, no matter how disordered and damaging to others. Thank you for your example of great faith, your willingness to persevere under difficult circumstances, and to believe against all odds! Dear St. Monica, please pray for my husband Chris who is lost and troubled. He says he feels empty inside and wants a divorce. He does not have faith and I pray that he may accept Jesus Christ as his Lord and Savior and find peace within. He is not happy and will not be until he fills the emptiness inside with the love of Christ. I love Chris, St. Monica, and I pray that Chris finds salvation through Christ, that our marriage is restored, and that our family is saved. I want my husband back and our boys want their daddy back fully present and alive in Christ. Please pray for us St. Monica and intercede on our behalf. Your prayer intention could have been written by me,as I am praying for the exact same situation except I have daughters, not sons! I will pray for you and your husband during this novena. May God grant us both strength to not give up on the power of prayer. Saint Monica I lift all those that are suffering with their marriage o you please present them to the Lord most high. I also left my daughter to that did not do too well in her exam. Please pray for her like you prayed for your son as she quarry it she will get better results . Also pray for her that she will remain forcus to do well in the future.